Click on "Cook in Whitby" and "Royal Navy and Canada" or explore the timeline. Scroll down and choose a topic. Click on an image for a bigger picture and information. Captain James Cook became very famous after his death in 1779, and was commonly depicted in books, on plaques and posters. Watch a video clip about life aboard "Endeavour"
This is a replica of Cook's ship. Take a virtual tour of a replica of Cook's ship "Endeavour"
Scroll down and click on topics that interest you. Print out and shade in a picture of "Endeavour"
Click on "download" below the ship picture or find word searches to print out and solve. Choose an explorer that interests you. 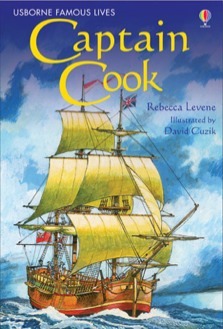 Vivid account of the extraordinary life of the explorer, Captain Cook. Includes detailed maps of each of Cook's three incredible voyages, along with a chronology of his life. Internet links to recommended websites to find out more about Captain Cook's life and discoveries.